An airline passenger barred from a flight for wearing a T-shirt labeling President Bush a terrorist has threatened legal action against Australia's flag carrier Qantas. 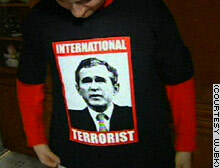 Airline staff said the T-shirt of Bush with the tagline "World's number 1 terrorist" could have upset other passengers and demanded it be changed for another. But Jasson, who had earlier traveled on a Qantas domestic flight wearing the Bush T-shirt, said his right to freedom of speech had been infringed by Qantas. Qantas issued a statement saying comments made verbally or on a T-shirt which had the potential to offend other travelers or threaten the security of aircraft "will not be tolerated." Go To Prison And Live Longer? For black inmates, the rate was 57 percent lower than among the overall black population — 206 versus 484. But white and Hispanic prisoners both had death rates slightly above their counterparts in the overall population. The Justice Department's Bureau of Justice Statistics said 12,129 state prisoners died between 2001 through 2004. Eight percent were murdered or killed themselves, 2 percent died of alcohol, drugs or accidental injuries, and 1 percent of the deaths could not be explained, the report said. The rest of the deaths — 89 percent — were due to medical reasons. Of those, two-thirds of inmates had the medical problem they died of before they were admitted to prison. Medical problems that were most common among both men and women in state prisons were heart disease, lung and liver cancer, liver diseases and AIDS-related causes. But the death rate among men was 72 percent higher than among women. Nearly one-quarter of the women who died had breast, ovarian, cervical or uterine cancer. Four percent of the men who died had prostate or testicular cancer. More than half the inmates 65 or older who died in state prisons were at least 55 when they were admitted to prison. State prison officials reported that 94 percent of their inmates who died from an illness had been evaluated by a medical professional for that illness, and 93 percent got medication for it. Eighty-nine percent of these inmates had gotten X-rays, MRI exams, blood tests and other diagnostic work, state prison officials told the bureau. No drinking and bullfighting please. Both bulls and bullfighters were breathalysed at a South Indian bull-taming festival in a bid to quell the bravado of contestants and slash the number of injuries, authorities said. More than 400 people were hurt last year during the ancient sport, known as Jallikattu, when Indians try to tame running bulls by grabbing the animals' horns or their distinctive hump. The animals and the fighters are often plied beforehand with large amounts of a local brew, known as arrack, at the festival in the southeastern state of Tamil Nadu. But the number of injuries plummeted to just 60 this year after authorities introduced medical tests for the first time, district collector T Udayachandran said today. "Seven bulls and four men were disqualified during tests to detect consumption of alcohol or other banned substances," he said. Apart from breathalyser tests, authorities took blood or looked into the bulls' eyes to see if they were drunk. Witnesses said the sober bulls were not so wild and the bullfighters decidedly more cautious this year. The pilot of a Continental Airlines flight became ill after takeoff and was later pronounced dead after the plane made an emergency landing, a company spokeswoman said. The 210 passengers on Saturday's flight, which departed from Houston, were never in danger and the co-pilot landed the plane safely, Continental spokeswoman Macky Osorio said. The airline said only that the pilot suffered a "serious medical problem." Continental believes the pilot died of natural causes, Osorio said. The pilot's name was not released. The flight, bound for Puerto Vallarta, Mexico, took off from Houston's George Bush Intercontinental Airport and was diverted to McAllen-Miller International Airport. The flight continued to Mexico with a new crew, Osorio said. They set up an experiment in which they put 45 college students into a functional magnetic resonance imaging scanner, which can take real-time images of brain activity. They gave the students various games to play, and told them that winning earned cash for either themselves or for a charity. The students had chosen the charities beforehand from a list, the researchers report in the journal Nature Neuroscience. The students reacted differently depending on whether they won for themselves or for charity with the ones who described themselves as altruistic responding more strongly. "The game involved reacting as fast as one can to the appearance of a target; if one responds fast enough, then money was earned," Huettel said. The task was fairly simple, and the students did not give up any payments to themselves to give to the charities. But it cost enough effort that Huettel believes it did represent altruistic intent. "It's challenging and requires them to focus," Huettel said in a telephone interview. "They are lying in a tube, and it is a little tiring for them. Even though it doesn't cost them anything monetarily, it costs them their effort." And the researchers were surprised by their findings. Some other studies had predicted that giving would activate the reward systems in the brain. In fact, another center was activated when the students either won money for charity, or watched the computer win money for charity. "This area we saw was the posterior superior temporal cortex," Huettel said. "It's part of the parietal lobe. 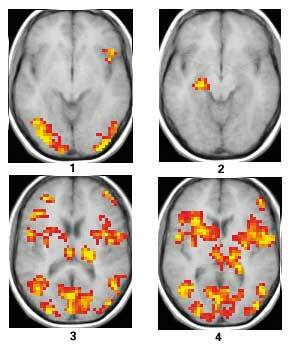 What this brain area seems to be involved in is extracting meaning from things you see." His team asked the students how altruistic they were, and found the test strongly correlated with their own reports of unselfish activity, such as helping a stranger or comforting a friend. He admits it is very difficult to measure altruism. "If done in the laboratory, it would be difficult to know whether subjects were trying to impress the experimenter with their actions, and thus one could not be sure of the validity of any measurements," Huettel said. "Conversely, trying to watch people in their daily lives would make data collection nearly impossible. So, we settled on self-reports as a good, albeit imperfect, measure." Huettel believes it is valid to try to assess altruism scientifically. "It is hardly the case that all altruistic acts come from people who are religiously faithful; there are undoubtedly many altruistic atheists," He said. "And, a religious explanation would have considerable difficulty explaining why some animals help others of their species at significant cost or danger to themselves." Next his team hopes to test children, and find out how and when altruism develops. Tilli said the statement was not a threat. "I didn't say who — I could've meant (Osama) bin Laden," he said Friday.